Charlotte's parent's was an arranged marriage, which George agreed to in order to get parliament to settle his enormous debts which at the time amounted to £630,000 . On first sight of his future wife, George was thoroughly dismayed and in a state of shock, "I am not well", he announced "pray get me a glass of brandy," The marriage ceremony proceeded as arranged, attended by his well pleased father, George III, on the evening of 8th April, 1795 at the Chapel Royal at St. James' Palace. The bride wore a elaborate dress of silver tissue and lace and a velvet robe lined with ermine. The distraught bridegroom spent his wedding night lying on the bedroom floor by the fireplace in a drunken stupor. Although he was repelled by his wife, he did his duty and brought himself to consummate the marriage and the Princess of Wales gave birth to a daughter and heir to the throne, Princess Charlotte, exactly nine months after the marriage, on 7th January, 1796 at Carlton House. After the birth of the child George promptly abandoned Caroline. George III, who was sympathetic toward the plight of his niece, Princess Caroline and never on the best of terms with his errant son, expressed a desire to have Charlotte live with him so that he could supervise her upbringing and education. A battle of wills followed over who was going to control the raising and education of Princess Charlotte. The prince was willing to accede to the wishes of his father, but wanted Caroline to have no influence in her daughter's education, while the king wanted her to be party to decisions about her daughter. A reconciliation took place between George and his father and an agreement about Charlotte's future finally reached. She was to remain under her father's care. The Princess of Wales was forbidden to see her daughter on a daily basis and in 1799 was banished. The child's first governess was Lady Elgin. In late 1810, Charlotte's grandfather, George III began his final descent into madness. Charlotte and the King were very fond of each other, and the young Princess was greatly saddened by his illness. On 6 February 1811, Charlotte's father was sworn in as Prince Regent before the Privy Council, as Charlotte rode back and forth in the gardens outside Carlton House, trying to catch glimpses of the ceremony through the ground-floor windows. Not surprisingly Charlotte grew up to be a stormy and rebellious teenager. She was required to spend most of her time at Windsor with her maiden aunts. Bored, she developed an affection for her cousin, George FitzClarence, the illegitimate son of her uncle William, Duke of Clarence by the actress Dorothy Jordan. Soon after, FitzClarence was called to Brighton to join his regiment, and Charlotte became involved with Lieutenant Charles Hesse of the Light Dragoons, rumoured to be the illegitimate son of Frederick, Duke of York. The couple had a number of clandestine meetings. 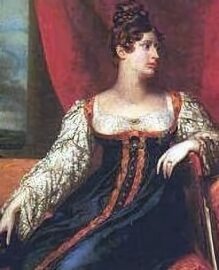 Lady de Clifford feared the Prince Regent would be furious should they be discovered, but the delighted Princess Caroline did everything that she could to encourage the relationship, even to the point of allowing them time alone in a room in her apartments. Their meetings ended when Hesse left to join the British forces in Spain. Most of the Royal Family, with the exception of her father, were fully aware of these meetings, but did nothing to interfere, disapproving of the way George was treating his daughter. 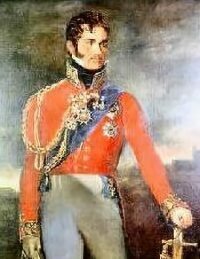 The Prince Regent decided to marry Charlotte to William, Hereditary Prince of Orange, son and heir-apparent of Prince William VI of Orange. The Princess of Wales, however, opposed the match and acquired great public support. Charlotte told her suitor that if they were to marry, her mother would have to be welcome in their home, a condition sure to be unacceptable to the Prince Regent. When the Prince of Orange would not agree to this, Charlotte broke off the engagement. Her father responsed by ordering her to remain at her residence at Warwick House until she could be taken to Cranbourne Lodge at Windsor, where she would be allowed to see no one except her grandmother the Queen. When informed of this, Charlotte ran out into the street. A gentleman, who witnessed her distress, , helped the Princess find a hackney cab, in which she was taken to her mother's house from where she summoned Whig politicians to advise her. After lengthy arguments, she was advised her to return to her father's house, which she did the following day. Caroline of Brunswick went to live abroad, inviting scandal by taking lovers and running up vast debts.After the failed attempt to force his daughter into a marriage with the Prince of Orange, whom she loathed, the Regent married his daughter and the heiress to the throne to Leopold George Christian Frederick of Saxe-Coburg- Saalfield, (pictured right) her own choice as a husband. Leopold was the youngest child of Francis, Duke of Saxe-Coburg-Saalfeld and Augusta of Reuss-Ebersdorf. The couple were married on 2 May, 1816, at Carlton House. After spending their honeymoon at Oatlands in Surrey, the country seat of the Duke of York, the couple set up home at Claremont. The cool and collected Leopold was to prove a calming influence on his tempestuous and headstrong wife. After two miscarriages, Charlotte became pregnant with what was hoped would be a grandson and the heir in the next generation to the British throne. Charlotte was cared for during her pregnancy by Sir Richard Croft, who was not a physician, but an accoucheur, or male midwife. She was believed to be due to deliver on 19 October, but her contractions only began on the evening of 3 November. The Prince Regent was summoned and hurried to be present when the labour proved to be difficult and protracted, Caroline's ordeal lasted for for fifty hours, as it became clear that Charlotte might be unable to give birth to the child unaided, Croft and Charlotte's personal physician, Matthew Baillie, decided to send for the obstetrician John Sims. However, Croft did not allow Sims to see the patient, and forceps were not used. Finally the child was born at nine o'clock on 6th November, a boy, born dead. The child's head which had been in a sideways position, was too large for her pelvis. Efforts to resuscitate the baby failed, bservers stated that he was a large and handsome boy, resembling the Royal Family. The sad news was related to George on his reaching Carlton House, being told that his daughter herself was doing well, he retired exhausted to bed. Though the mother seemed at first to be recovering well from her horrendous ordeal, she complained that evening of severe stomach pains and began to vomit. She later developed a pain in her chest, before going into convulsions. 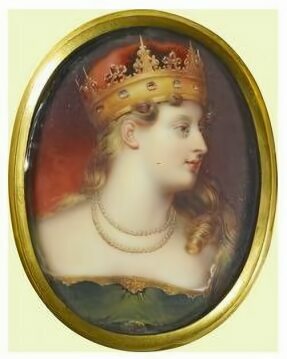 It has been suggested that Charlotte may have died as a result of porphyria, inherited from her grandfather, George III. Soon after the Regent was awoken by his brother, the Duke of York and informed that his only daughter was dead. Highly emotional by nature, George was extremely distraught. The following day he went to visit his bereaved son-in-law at Carlton House. In contrast to the sad but composed Leopold, George was overcome and worked himself into a very distressed condition, which was the cause of further alarm. Charlotte and her son were buried at St. George's Chapel, Windsor, the Regent was prostrated with grief and unable to attend the funeral. Her elaborate carved memorial is situated in a side chapel toward the back of the nave. George's recovery from his bereavement was slow, he became somewhat reclusive and dwelled excessively on the shock of the sad event which had overwhelmed him. Charlotte's obstetrician, Sir Richard Croft was widely blamed for the Princess' death and was said to have been negligent. Both the Regent and Prince Leopold publicly exonerated him from blame, but the damage to his reputation was done and eighteen months later Croft shot himself. Prince Leopold of Saxe-Coburg-Saalfield was later to act as principal adviser to his young niece Victoria. In June 1831, he became king of the Belgians, fifteen years after Charlotte's death , he married Louise-Marie, daughter of Louis-Philippe of France, and they had four children, one of whom was named Charlotte in her honour. He was to be instrumental in arranging the marriage of Queen Victoria to his nephew, Albert of Saxe-Coburg-Gotha.